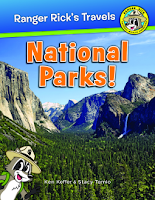 Once Upon a Shelf...: Ranger Rick's Travels: National Parks! It is great that all of the United States National Parks are included. I love the organized approach. It will help anyone find the highlights and also encourages us to find the hidden treasures, my favorite thing to do. Each park is broken down into sections for quick reference. The photographs are truly amazing. I appreciate that this book also encourages us to celebrate the fact that we have these glorious National Parks, respect them, and to think of all the people who help make them available for us (National Park Service).